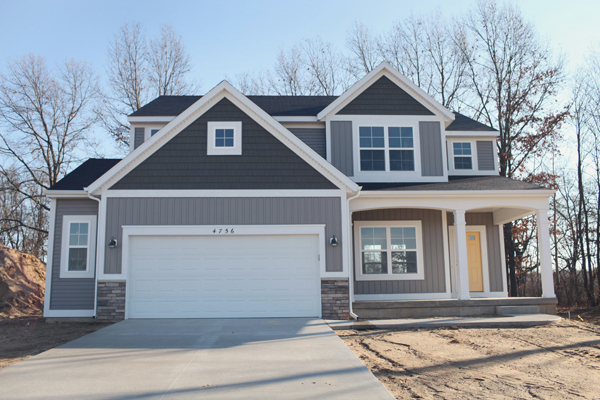 Ok, im usually not into brand new houses. I love the 70s, i love the 30s… i miss the beautiful houses in Savannah and all their weird qwerks. BUT with that said, Rhi from Hey Gorgeous Events bought one of THE most fabulous houses ever. I mean its stinking adorable. I love every detail about it. How bright every room is, the arched ceilings, the built ins… Oh I just wonder what sort of house I would have if it was built from scratch. Anyway, she has posted the initial interiors and her kitchen after they moved in. Be prepared for cute perfection. 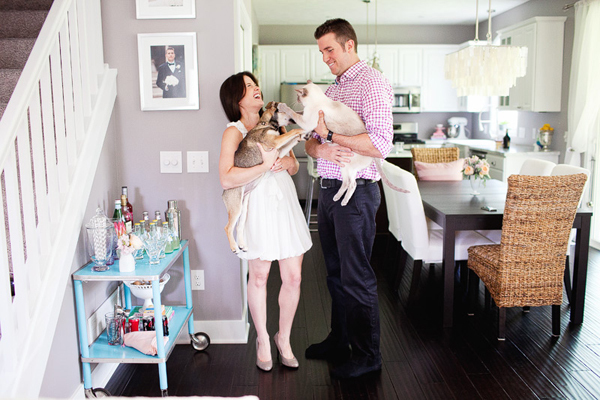 Seriously, are you prepared for the most adorable kitchen of all kitchens? 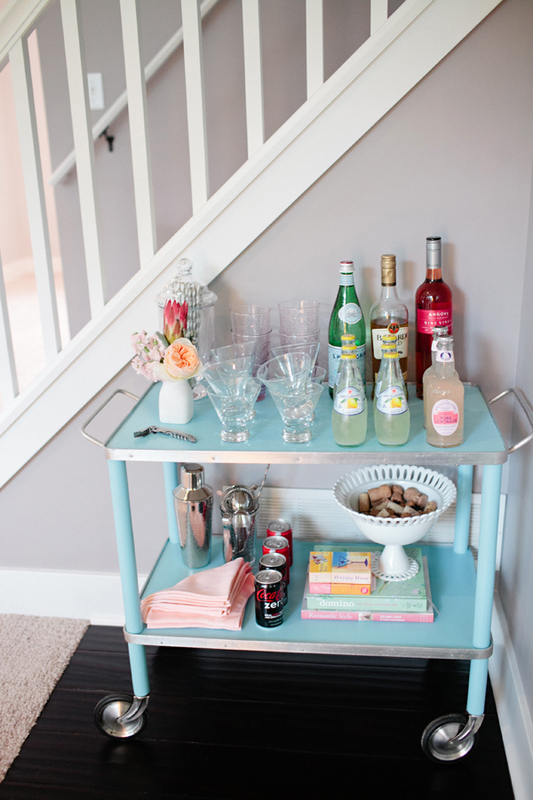 I really cant handle this adorable vintage blue drink cart. 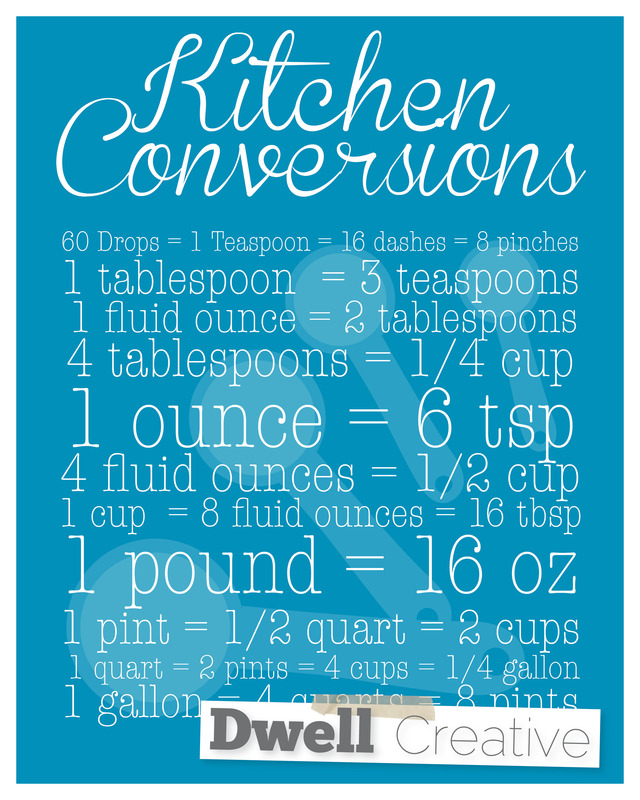 So these guys all started from my constant need to check kitchen conversions online – im just bad at remembering how many cups in a liter, tablespoons in teaspoons, etc. so i decided to make a quick an easy “art” guide right there on the wall. So i made some more 🙂 Find them all on my Etsy shop, here! Without the logo at the bottom, of course! Can you tell I got a part time job at starbucks?! 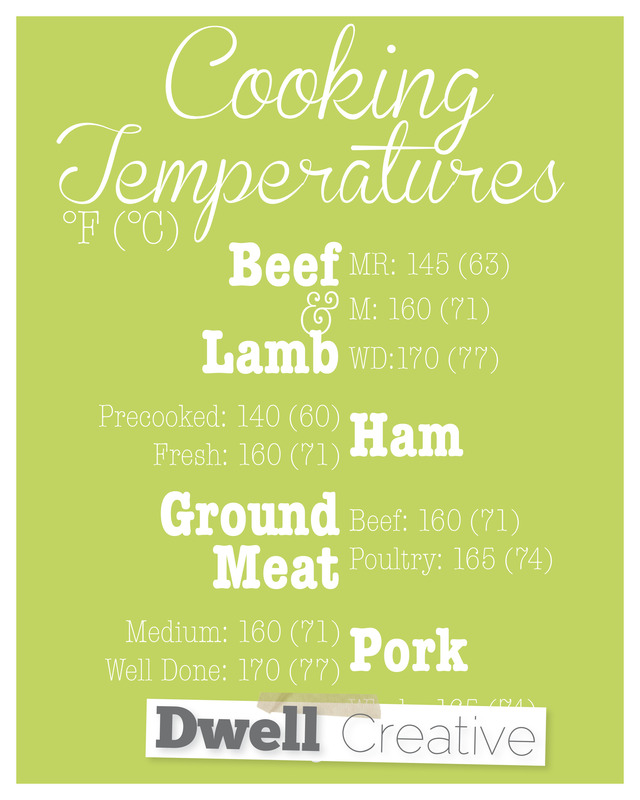 Also made this chart to remember cooking temperatures – super helpful! 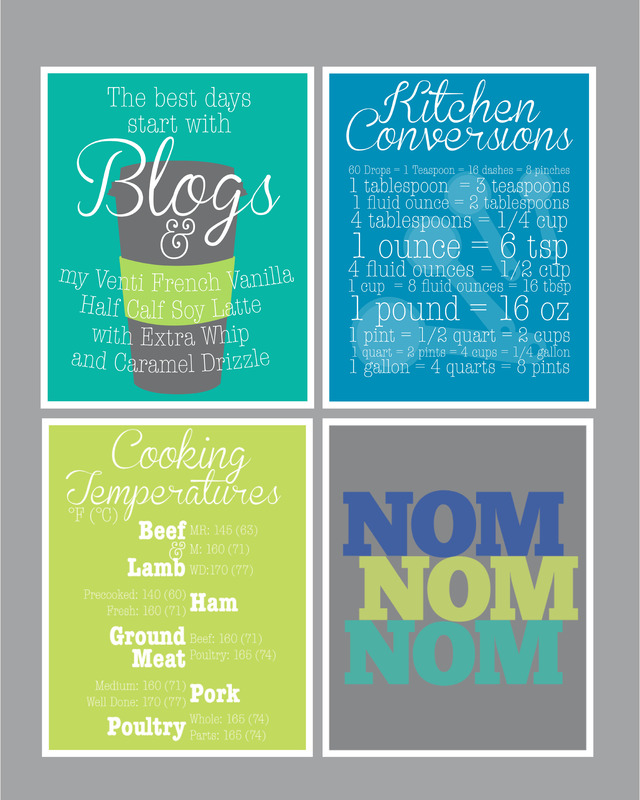 Hopefully these art charts will be helpful while cooking up some delish grub! I dont know about you guys, but im flat broke. I tend to not even do anything for mothers day! I know… im a bad daughter. BUT NOT THIS YEAR! Heres a list of fun DIY ideas to make your mom something fun, pretty or yummy this mothers day. At at only a few bucks each, theres no excuse not to! Most of these I found off of the lovely Pinterest or off fabtabulous blogs! There are multiple handmade Spa goodies over on MarthaStewart.com go check it out and other DIYs like Body scrubs, lip balm and of course, Bath Fizzies! Always loved this project and wanted to give it a go. For the whole DIY check it out over here. For just 5 bucks you can pick up a Pebeo Porcelaine paint parker and hand paint on some white mugs. Full DIY here. I like the idea to stick with a theme such as botanical… makes the set really go together. 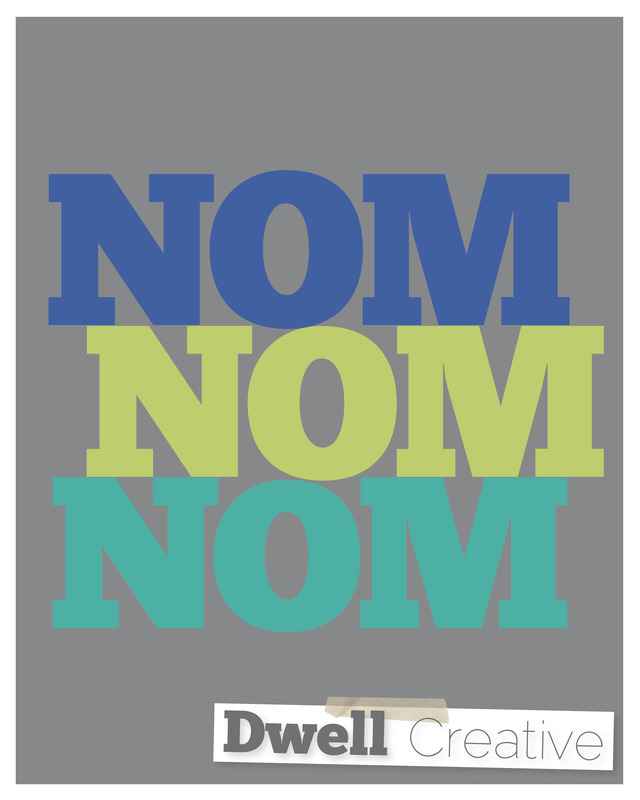 Theres also a free template as well! Heres another project that I’ve been wanting to try for a while. You’ve got two options, either take a white scarf and use Fabric markers like in the DIY featured here… OR use a colored scarf and a bleach pen! Most likely you already have one… paint, let it sit for 10-15 minutes and wash it off under running water. Thrown them in the wash and thats it! Cant wait to try this project. You BETTER do something for yo mama this year… you have no excuse now. Oh i adore when i find a new beautiful blog to follow. This one is just crazy to me… our style is identical. No seriously. Usually most blogs theres a few things posted that im just not crazy about. With Lovely Nest, i.love.everything. Starting out with her blog design – adorbs. Globes? that are DIY HAND PAINTED? 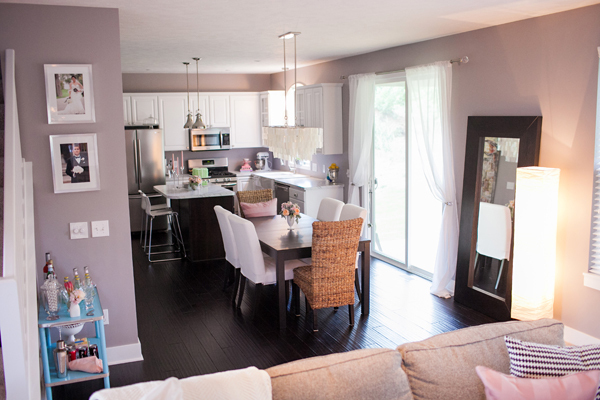 Adorable interior design… of course! Check out The Lovely Nest! You wont be disappointed. Oh fyi, her most recent post features an adorable 7 week old puppy. yup. a puppy. You’ve been warned. I always adore local austin artists so I always enjoy finding new ones! Abby has never taken any photography classes but one day just decided to pick up a vintage camera and start shooting… I love the small glimpse into her quirky life! Check her out at Abbytryagain.com or her blog here. And if theres any Austinites reading, she is hosting an event at West Elm on Sat the 26th from 1-6 that i am definitely going to have to check out! I have to admit my love for Turquoise. My entire bedroom is covered in it. So of course, i visit this blog daily: House of Turquoise. Here is one of my new fav blogs: decor8. 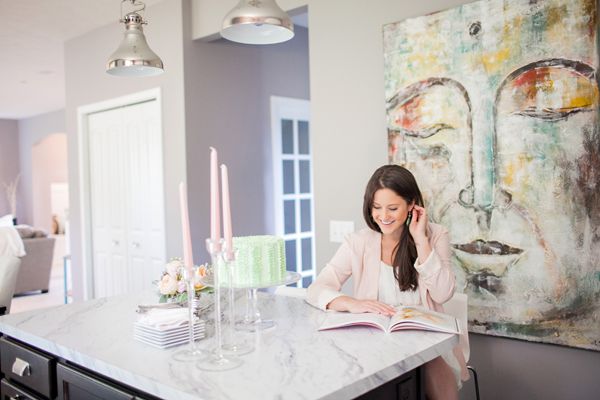 Holly has an amazing eye for style and I always find amazing resources from this lovely lady. Check out some of her recent posts. So i thought i would share my other blog with you… *GASP! * She has a life outside of RadDesign?! 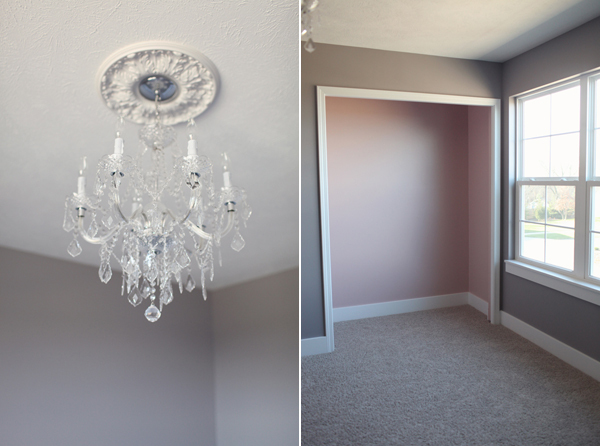 It’s true… actually my interest in interior design came from my background in photography and graphic design. So i thought i would share my other sites so you can cruise around and check out what i do when i’m not staring at a computer screen or building random furniture. BLOG: My photo blog is where I’ll be posting recent projects, inspiration, travel photography and really whatever is going on in that realm of my life. Jump over there and check it out!